Valve faced a monumental task when it chose to make a full-length sequel to the brilliant physics-based puzzler Portal. With such a hard act to follow, would the second game be able to live up to the near perfection of the original? Would the premise and style of the first game, a perfect fit at just a few hours, be able to sustain itself across a game more than twice that size? Would the portal gun gimmick or GLaDOS’s sociopathic yet amusing monologues start to feel repetitive? These questions were decisively answered in 2011 with Portal 2: Yes, absolutely, and a resounding no! A follow-up that surpassed the original seemed impossible, but in retrospect the first game was really just a warm-up for the main event. A wider variety of environments and tools, the inclusion of more memorable “characters”, and vastly improved visuals made the ongoing attempt to escape Aperture Labs feel just as fresh and even more exciting than the first time around. While Portal was essentially a running tutorial much of the time, Portal 2 is the full game it was preparing us for, though not without some additional training for all the new toys like light bridges, liquid goo and catapults that were brought into play. The longer game time allows the puzzles even more space to gradually grow and increase in complexity. An impressively challenging co-op campaign was added, allowing players to experience portals in a whole new way, this time with friends. It’s hard to think of anything the sequel didn’t improve. GLaDOS naturally returns, and the new characters manage to be almost as amusing , which isn’t surprising as they’re voiced by Stephen Merchant and J.K. Simmons. And revelations about the history of Aperture Science and GLaDOS herself make the whole experience that much more intriguing. 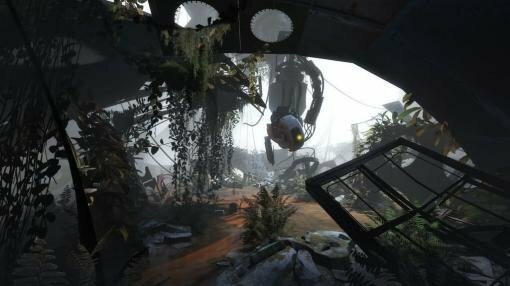 Valve seems unable to set the bar so high they can’t leap over it themselves, and Portal 2 is a testament to that. It’s nothing like any adventure you’ve every seen, but it’s a must-play for fans of any genre, and an instant classic that propelled its way right into our top ten. Many adventure games follow a straightforward path: there's a beginning, a middle and an end, with no place for player choices and their consequences. Even in games that offer multiple endings, it's almost always a matter of a very clear crossroad near the end. But The Pandora Directive proved to be so much more advanced in 1996. 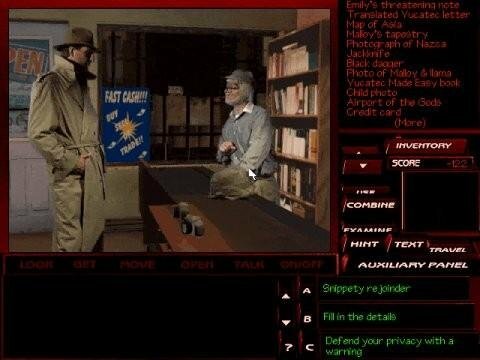 In fact, the fourth installment of the Tex Murphy series (though only the second to use the now-familiar FMV/3D exploration style) ensured that every single choice – even the most seemingly unimportant – truly matter. As a result, the outcome of each player’s adventure varies greatly depending solely on the choices you make, ranging from a satisfying ending that sees our hero triumph and win the heart of his lady to a grim, hopeless and depressing conclusion in true film noir fashion. Back in the trench coat, fedora, and gumshoes of the titular detective, you must decide: will you be a jaded, cynical PI or will you play nice and be a gentleman? How will you treat the various women that gravitate around Tex? And what about Chelsee? Will you be faithful to your blossoming romance with her? Will you answer the phone or will you pretend to be outside? The many options present a deeply engrossing and incredibly rewarding experience. Penned once again by Chris Jones and Aaron Conners, this sprawling masterpiece about a government conspiracy concealing aliens allows you to role-play Tex as you like, and every finale is definitely worth exploring. Add to the mix some challenging puzzles, a vast live-action cast brought to life by some great performances, dozens of 3D locales full of nooks and crannies you can thoroughly explore, and The Pandora Directive did what seemed impossible only two years earlier: it beat its own accomplished predecessor at its own game. How do you follow up one of the most popular comic adventure games of all time? If you’re LucasArts circa 1991, you make an even better one. While still a comedy with plenty of laughs, Guybrush Threepwood’s second outing is a slightly darker affair than its predecessor. He is a more mature adventurer this time, a fact reflected in the tone and art style of the game. Voodoo torture with agonizing animations is commonplace, and the ghost pirate LeChuck is at his scheming worst in his quest for revenge against Guybrush, now seeking the legendary Big Whoop. The changes didn’t hold back the public though, as the game was massively hyped by the mainstream press and lapped up en masse at the time of release. And rightfully so! The sequel is a fantastic game: insults, spitting contests, voodoo – what's not to love? Well, the hugely controversial ending for some, though for others it’s just another jewel in its crown. Retaining much of the same crew that worked on The Secret of Monkey Island, it improved on its predecessor in almost every way. 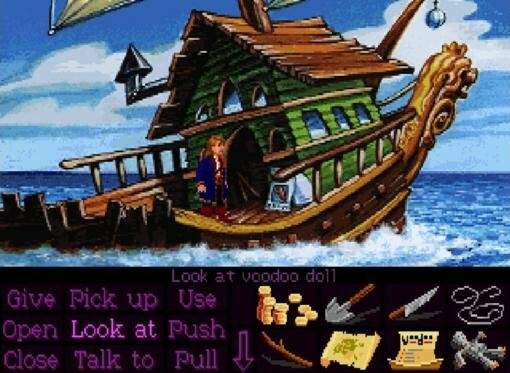 The graphics were gorgeous and really brought to life the characters we’d already come to love, the SCUMM engine was even more refined, two different difficulty levels were offered, the first-rate story featured puzzles that required plenty of thought but no frustration, and the innovative music was top-notch. When it comes to comic adventures, you can’t get much better than Monkey Island 2. It’s no surprise that like its older brother, its recent remake is appealing to a whole new generation of gamers all over again. Where do the accolades start for Smoking Car Productions’ The Last Express? Is it the rotoscoped graphics that give the game a uniquely classy sense of style? Is it the painstaking historical recreation of the final voyage of the Orient Express before World War I? Is it the stunningly immersive real-time progression of gameplay? Or is it the thrilling and extraordinarily literate writing? Why choose? There really isn't anything quite like Jordan Mechner’s 1997 adventure. While the story of American doctor Robert Cath and the international intrigue he encounters on a train journey from Paris to Constantinople does head to some pretty fantastical places, it is equally balanced by a genuine sense of realism and authenticity. Mechner's team went to great lengths to portray everything from foreign languages to daily weather patterns with historical accuracy. The characters portray the broad and tumultuous sociopolitical climate of the era, as Cath encounters everyone from German businessmen to Serbian militants. 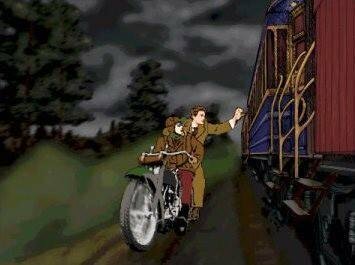 And in a still-unparalleled design decision, live actors were filmed and then hand-traced in a style reminiscent of early 20th century illustration. Making things feel even more authentic is the game’s real-time progression: The Last Express doesn't wait for you. The train barrels relentlessly toward Constantinople, stopping at several famous locales along the way. Similarly, the other passengers have their own agendas to attend to; they move around the train, have conversations, go to sleep, eat dinner, conduct secret meetings, and so on. As Cath, players have more or less total freedom to explore the train and observe, interact with fellow passengers, or sneak around trying to find information. This gives the game an astounding level of replayability for an adventure game, since you'll never be able to see everything in a given playthrough; while you're off exploring one car, something else (something probably very interesting) is going on in another. And if you don’t like the direction your recent choices have taken, rather than simply restore an old save file, simply rewind time and begin that segment of the journey all over again. It all adds up to a tense, immersive, and innovative adventure that few other games have equaled. 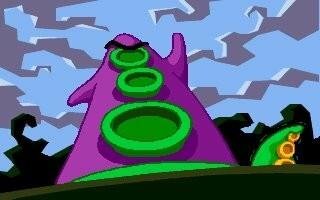 When LucasArts’ Tim Schafer and Dave Grossman were given an opportunity to continue Ron Gilbert’s Maniac Mansion series in 1993’s Day of the Tentacle, they attacked that goal with a completely unhinged sense of whimsy and irreverence for American history. The extraordinary result was a legacy of hilarity that made genre immortals out of bookish Bernard, rocker Hoagie, and ditzy Laverne, setting new standards (yet to be matched decades later) for comedic puzzle design in the process. Although once again featuring three playable characters, the game marked a radical departure from its predecessor, reinventing the franchise as a story of unlikely heroes spread out across 400 years of past, present, and future times in an attempt to stop the insane Purple Tentacle from ingesting toxic sludge. Filled with quirky charm and outlandish scenarios, this game has it all, from a frozen hamster to fake barf to a flushable inventory-swapping Chron-O-John. The game succeeds on every significant level – a unique and beautiful art style that defines “cartoonish” perspective; spectacular voice acting across the board that exponentially increases the quality of the already-brilliant dialogue (at a time when the CD-ROM was still a relatively new luxury); ingenious puzzle design, featuring most of the greatest time-travel puzzles ever designed; and a phenomenal attention to cinematic detail that can only be described as “Schafer-esque.” It begins with what is still the only comedy adventure game intro that truly feels theatrical, and the final shot before the credits roll is the perfect payoff. It is hard to find enough superlatives to describe a virtually flawless game – Day of the Tentacle was and for now remains the greatest comedy adventure ever.